I’ve become a bit of a coconut addict, which is so funny since I never used to like coconut. Now, I have to include it in my three week rotation; I only get to eat it for 7 days, and then I must take 14 days off since I don’t want to develop an intolerance to coconut. What I have developed is a lemon intolerance, which means for the time being I can’t make the yummy Lemon Coconut Cream Candies I shared with you a few weeks ago. 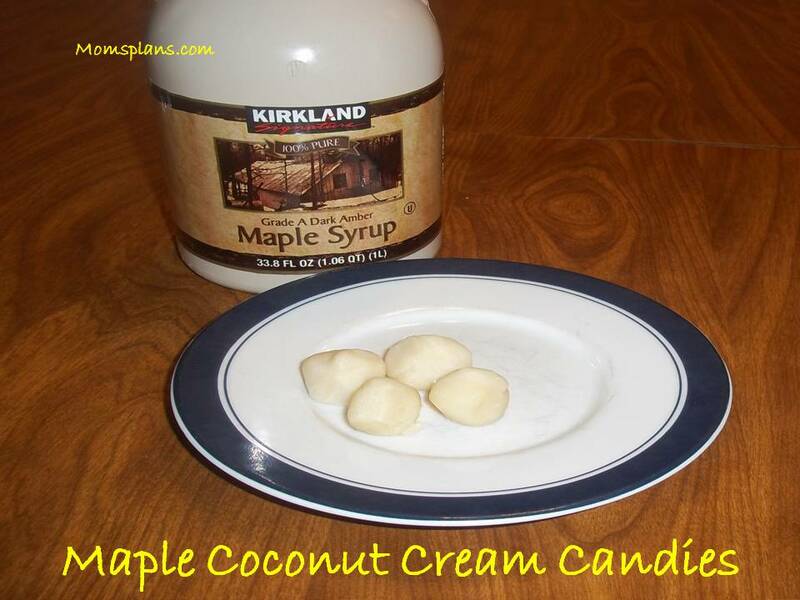 As a replacement (and a very tasty replacement), I developed Maple Coconut Cream Candies. These little balls of lusciousness only take two ingredients and are a snap to make. -Microwave the coconut cream in a bowl for 30 to 45 seconds, until it is smooth and creamy, but not too runny. -Stir in the maple syrup until combined. -Form in balls and put on a cookie sheet lined with wax paper. These taste best out of the freezer when you let them sit out at room temperature for 5 to 10 minutes. I get my coconut cream from Tropical Traditions when it goes on sale, but you may be able to find it at your local health food store. I shared this post at Tempt My Tummy Tuesday, Slightly Indulgent Tuesdays, Try a New Recipe Tuesday, Kids in the Kitchen, Tuesday’s Table, Waste Not Want Not Wednesday, Tasty Traditions. Thanks for linking with Kids in the kitchen! pinned and shared! is coconut cream the same thing as cocount oil? No. Coconut cream is rich and thick and velvety. It is all white. I couldn’t find it in any stores so I had to get it from Tropical Traditions.